How did the media, old and new, respond to the April 15, 2013 explosions? Well, all depends on what media, channel, journalist and day you choose to read, listen or watch. One thing is valid for all, though: with internet and social media the flow of information has increased so much and the vigilants are so numerous that mistakes as well as criticism of those mistakes have become an stampede impossible to manage on real time without an army of observers and researchers. With only two hands and two eyes, trying to see some light among the jungle can only give an approximation to a very important problem. Without sufficient time to digest so much information, any definitive conclusions must wait. Let me start, nevertheless, this overview with this optimistic report from ABC News of how social media handled the crisis. Transcript for Social Media’s Role in Capture of Boston Bombing Suspects. Last week was an intense one. Big stories were breaking by the hour _ the Boston bombing and the investigation that stretched to the Russia and the Caucuses, the fertilizer plant explosion in the Texas town of West, ricin mailed to several lawmakers, congressional defeat for toughening access to guns, a large earthquake in China, potential flooding in the Midwest _ and so on. These trends didn’t come out of the blue in Boston. 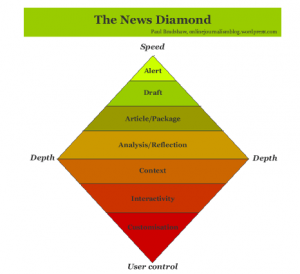 They’ve been evolving for years, as new social networks have grown, creating, as media academic Paul Bradshaw showed in his model for the 21st century newsroom, a multi-platform multisource process that Beckett adapted behind the News Diamond model for his book SuperMedia on the arrival of networked journalism. We’ve all tried to update those models in response to developing news practice, and the Boston Marathon bombing story shows how far we’ve had to move. This morning I woke up to news that Boston police were involved in a shooting in the district of Watertown just days after the marathon bombing. I won’t give the detailed event or news narrative but tapping into the coverage makes clear how different platforms now have varied concepts of what news is. I think this is a good thing if it means we get choice. Though it must confuse the audience at times and it must also be a constant problem for journalists. Adam Gopnik’s post on April 19 in the New Yorker, Dzhokhar Tsarnaev, Lost and Found, is the perfect introduction to this entry. Only a journalist with long experience and the required background on how the security forces operate in times of crisis like a terrorist attack can dissect as he does the three main information roles involved in these situations and qualify coherently each of them. The incomparable A. J. Liebling wrote once that there are three kinds of journalists: the reporter, who says what he’s seen; the interpretive reporter, who says what he thinks is the meaning of what he’s seen; and the expert, who says what he thinks is the meaning of what he hasn’t seen. The first two—reporters and interpretive reporters—have been largely undermined by economics and incuriosity. But the third category never stops growing. We are now a nation of experts, with millions of people who know the meaning of everything that they haven’t actually experienced. There are still paradoxes and ironies, surprising heroes and unexpected goats in the new reign. Sometimes the professional experts really are undone by the amateurs. Waking up at six-thirty on Friday morning and hearing what had happened in the night, I followed my own generational instincts, honed on Vietnam and Watergate and the Gulf War, and turned on the television to see the usual stern-jawed “terrorism experts” being stern, scary, and obviously not knowing what the hell they were talking about. Within an hour, with the help of my eighteen-year-old, who insisted on turning from television toward the Web, we had the Tsarnaev brothers’ names, school history, wrestling involvement, vKontakte (Russian Facebook) pages, YouTube videos, and boxing photos. And we already had a glimpse of how this might be a tragedy of assimilation and its discontents. A well-liked student at a good public school, a Golden Gloves boxer—somehow they had transformed their souls in ways that made it possible for them to casually drop devices meant to rip human flesh apart next to an eight-year-old boy and his family. Of course, the pseudo-expertise of the official experts was more than matched by the pseudo-expertise of the amateurs. The night before, the attempt to hang this thing on a poor—and still missing—Indian-American student at Brown, had been crazy, not to mention libelous, not to mention heartbreaking to his family. 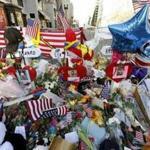 “Boston bombings: social media spirals out of control”. The headline tells it all. Ken Bensinger and Andrea Chang report in LAT on April 20 is an unmitigated ticking-off the Web for the “sleuths casting suspition on innocent people and spreading bad tips and paranoia” on the Boston blasts. Monday’s bombings, the first major terrorist attack on American soil in the age of smartphones, Twitter and Facebook, provided an opportunity for everyone to get involved. Within seconds of the first explosion, the Internet was alive with the collective ideas and reactions of the masses. But this watershed moment for social media quickly spiraled out of control. Legions of Web sleuths cast suspicion on at least four innocent people, spread innumerable bad tips and heightened the sense of panic and paranoia. Can Twitter help the media’s misinformation problem? ¿The New York Times was at its best after the tragedy in Boston? Reading its Public Editor Margart Sullivan’s twitt on April 20 selling her next day’s post on the subject, no doubt. THE TIMES, it is safe to say, had a very good week. On Monday, it won four Pulitzer Prizes — the third most in its history and twice as many as any other news organization this year. On Wednesday, it stayed on the safe side of “the Rubicon of inaccuracy” — in the words of Jill Abramson, the executive editor. That regrettable river was crossed, in a bizarre chain of events that was painful for any journalist to watch, by CNN, by the normally cautious Associated Press, and by many others who cited unnamed law enforcement sources. Before going into the details of the best, the worst and the ugly in the way the Boston blasts were covered, it is worth to pause and reflect on the relation between the FBI, the Police and the media during the crisis. Brian Shelter’s piece for the Times on April 19, News Media and Social Media Become Part of a Real-Time Manhunt Drama, underlines the core of the problem. The close interaction of reporters with the unfolding events underscored the complex relationship the news media have had with law enforcement authorities this week. News organizations have been both scolded for irresponsible reporting and employed to relay information to the public, sometimes at the same news conference. Earlier on Friday, the authorities thanked news media outlets for spreading the word that Bostonians should take shelter — and cautioned them against repeating secondhand or thinly sourced information. As thousands of police officers fanned out on Friday, the Massachusetts State Police asked local and national television networks to refrain from showing any live video of police movements, and for a time the Federal Aviation Administration restricted news helicopters from hovering above the area where one of the suspects was believed to be hiding. Reporters positioned themselves as close as they could to the action in Cambridge and nearby Watertown, at times spurring law enforcement officials to push them back. At one point, Kerry Sanders, a correspondent for NBC, was reporting while crouching for his own safety, in a scene evocative of wartime coverage from the Middle East. In his weekly review for Nieman Lab, Mark Coddington checked at great length the lively and, at times, tense discussion -both in traditional and new media- on the crisis coverage. The attacks spurred some remarkable journalism — most notably by the Boston Globe and Boston Herald — but it also launched a mess of misinformation and hasty conclusions. We’ll cover the misinformation on social media first, then get to the traditional media accuracy issues. Guardian journalist Simon Ricketts aptly documented many of the falsehoods floating around Twitter after the bombing, arguing that Twitter has become more unwieldy during crises as so many people tweet out of a need to “feel involved, concerned, part of the conversation.” Mathew Ingram of paidContent said that this is the way news flows now, for better or worse, and that it’s better to ask journalists to verify information than the platforms themselves. Here at the Lab, Hong Qu argued that it’s a mistake to pit journalistic norms against social media behavior, because the two complement each other. Poynter’s Jason Fry wrote a thoughtful post on how news orgs can bridge those two domains, proposing that while having reporters “on the ground” is still the core of covering breaking news, they should also have an “eye in the sky” gathering, filtering, and making judgments about a wide range of information, then presenting the best of it to readers. News orgs have long had this role internally during big breaking stories, he said, but it’s now shifted to an external one. The Boston Globe, from the very beginning of the crisis, has given a lesson of good reporting and good journalism in all its platforms and so has been recognized by most observers, starting with Nieman’s Coddington. Spanish Navarra’s University Media Reputation Intangibles project, in a post uploaded on April 19, did an explendid job on how the paper covered the dramatic events in Twitter. In a couple of hours after the bombing, some 150 tweets were published, while publishing policy in normal days was publishing around 40 tweets per day. This high intensity of publication was sustained in the following days. 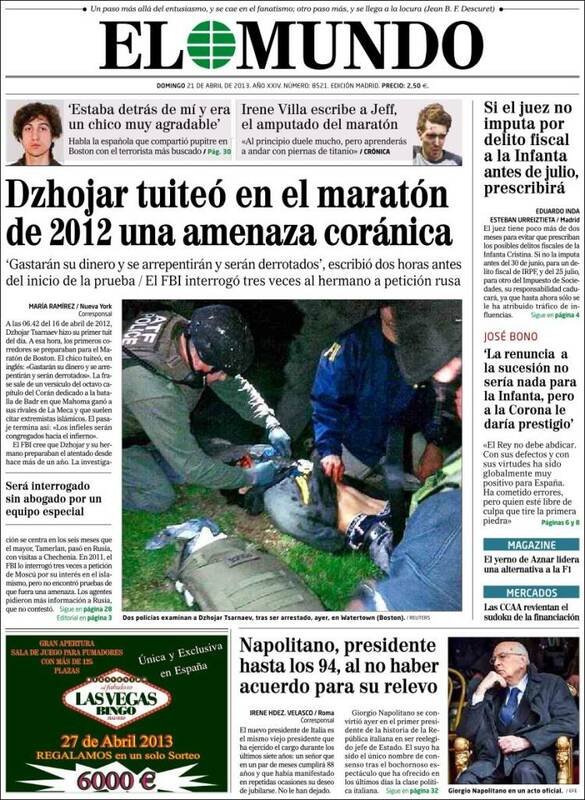 How was the crisis covered in the Spanish press? To answer this question, we’ll need several posts. Just reading the coverage in one paper, like El Mundo, leads me to think that, in spite of all the limitations, the first obligation of journalists -to be where the news is- was worth the effort. For those who can read Spanish, I’ll pick one of Eduardo Suarez’s many features from Boston –La policía captura con vida al segundo sospechoso de Boston-, a good example of what foreign correspondents are supposed to do in such complex circumstances with very limited means. El prófugo que mantuvo en vilo durante horas a la ciudad de Boston fue arrestado este viernes en un barco ubicado en el jardín de una de las casas de Watertown. El paradero de Dzhojar Tsarnaev no lo averiguaron los sabuesos del FBI sino un vecino de este suburbio de Boston, que vio manchas de sangre en la funda de lona del barco y alertó a las autoridades, cuyo objetivo era arrestar al sospechoso con vida para despejar las incógnitas de la investigación. Tsarnaev es uno de los dos jóvenes de origen checheno a los que la policía identifica como los autores del atentado contra el maratón de Boston. El otro es su hermano Tamerlan, que falleció en la madrugada del viernes después de un intercambio de disparos con la policía en una calle de Watertown. El ataque dejó a decenas de amputados y personas ingresadas en estado crítico y se cobró la vida del niño Martin Richard, la joven Krystle Campbell y la estudiante china Lu Lingzi. “La caza ha terminado. Se ha hecho justicia y el sospechoso está bajo custodia”, anunciaron este viernes en Twitter los responsables de la policía de Boston, que acertaron al dejar salir por unas horas a los vecinos de Watertown, encerrados desde la madrugada en sus casas por temor a una explosión. Uno de esos vecinos de Watertown aportó la pista decisiva al percatarse de que había sangre sobre la lona del barco. ¿Tiene derecho a guardar silencio? Columbia Journalism Review was among the first to criticize in the strongest terms the world’s media massive landing on Watertown after the attacks when, in Justin Peters’ words, the story was already gone. Late last night, sirens, explosions, and gunfire filled the air in quiet Watertown, MA, as the suspects in the Boston Marathon bombing faced off with police. A few local news networks and reporters were on the scene, delivering footage of and dispatches from a truly newsworthy setting. Now, 12 hours later, the rest of the world’s media has arrived to report on … nothing. The strong comments he got made him update his article with the following explanation. Peters’ last paragraph summarize quite well the author’s position. published on April 19 a resources’ guide, signed by Andrew Beaujon, to help journalists covering breaking news, crisis and terrorist attacks like the one in Boston. Vicki Krueger on questions to ask about ethics, credibility and how you get your reporting out on social media. Craig Silverman gathers resources for reporters combing through social media. 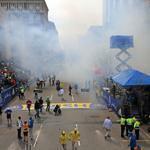 Was releasing pictures of Boston suspects the right decision? This in an amazing collection of analysis. Good Job! Congrats again. Thanks for including our study. Don´t forget local reporters from Boston Globe who broke the relation between marathon bombing suspects identified by FBI on photo as 1 and 2 with the old brother when was captured still alive. News came trought the witter account of Metro Editor @GlobeJenPeter, then on the web page of the Journal. Also @sethmnookin @taylordobbs @brianjdamico report real time news trought twitter ¿new media?